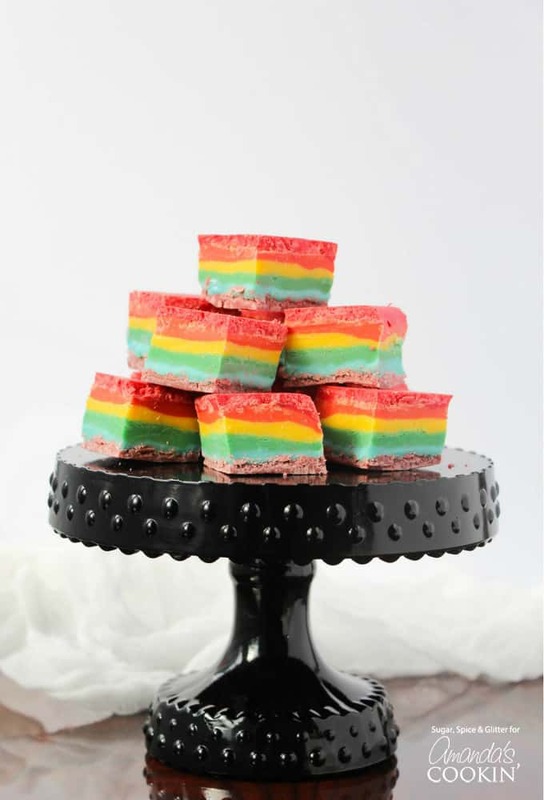 Rainbow Fudge: A bright, colorful, and delicious fudge recipe! No-cook fudge and no-churn ice creams are my favorite easy desserts for just about any occasion. 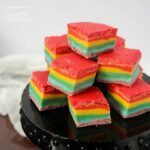 So naturally, with St. Patrick’s Day just around the corner, I had to make some Rainbow Fudge, a colorful and kid-friendly counterpart to my 4-Ingredient Bailey’s Fudge. Unlike the majority of my no-cook fudge recipes, this recipe can be a bit time-consuming because each layer needs to be added after the previous layer has had a chance to cool and set in the fridge. 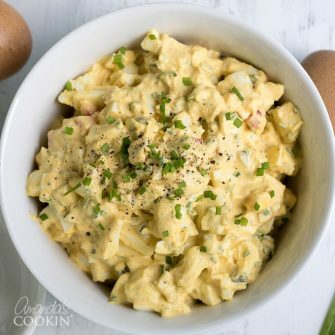 Adding a layer takes just a couple minutes each time, so it’s a great recipe to work on as you find yourself in the kitchen – make a layer at breakfast, when you’re waiting for lunch, when you pop in for an afternoon coffee, etc. For the third option, using food coloring, just ensure that your food coloring is not water-based because that can cause the chocolate or candy melts to separate and take on a curdled appearance. I’m going to write this recipe with method #1 in mind, but if you use method #2 you’ll want 1 cup of each primary colored candy melt. For a healthy rainbow recipe to enjoy before you dig into the fudge, check out my Fresh Rainbow Salsa or my Healthy Rainbow Spaghetti over on Sugar, Spice & Glitter. Find different colored candy melts here! Mesmerized by all the pretty colors? Check out this Rainbow Grilled Cheese, these Rainbow Pancakes, and also these fun Rainbows, Shamrocks, and Gold St. Patrick’s Day Cookies for more awesome rainbow inspired food! This rainbow fudge is sure to put a smile on everyone's faces! 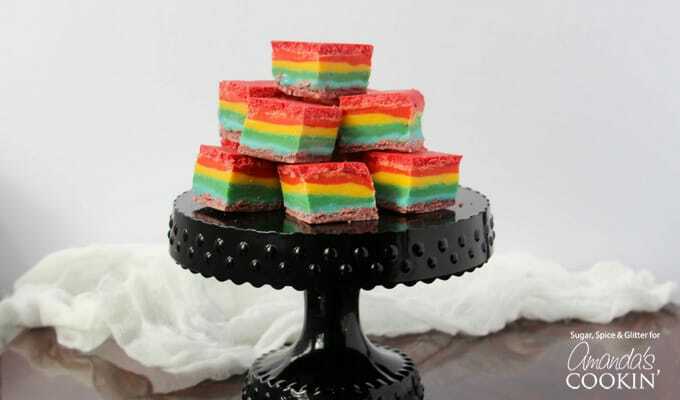 This recipe is a fun and ultra colorful twist to ordinary chocolate fudge. Place your red candy melts in a small microwavable bowl along with 2 Tablespoons of sweetened condensed milk. Heat in the microwave for 25 seconds, stir well, and reheat as needed to achieve a smooth texture. Pour the red candy melts into the bottom of the loaf pan and smooth down to an even layer with the back of a spoon or an offset spatula. Place the fudge in the fridge for at least an hour, until set and solid to the touch. Repeat process with the orange candy melts, then the yellow, green, blue, and ending with the purple. When all layers are added and set, pop the fudge out of the loaf pan and pull off the paper. Use a sharp kitchen knife to cut into squares and serve. This is one recipe I am going to have to keep on hand. The grandchildren would love this and my husband would too.